What is needed to run the the simulator? Read to get most recent information! Tips for using the simulator. The simulator: bumpless_transfer.exe . The simulator runs immediately after the download by clicking Open in the download window. Alternatively, you can first save a copy of the exe-file on any directory (folder) on your PC and then run the exe-file, which starts the simulator. A temperature control system for a liquid (water) tank with inflow and outflow is simulated. Via the front panel of the simulator you can select whether the temperature controller has bumpless transfer between automatic and manual mode or not. Bumpless transfer means that the control signal is not changed abruptly at switching between automatic and manual mode. where u0 is the nominal control signal, which is an adjustable constant. When the controller is in manual mode, u = u0. Bumpless transfer from automatic to manual mode is realized by giving u0 value equal to the control signal immediately before the switching (from automatic to manual mode). Bumpless transfer from automatic to manual mode is realized by ensuring that u0 keeps its value from manual mode and that up, ui and ud are set equal to 0 immediately before the switching. 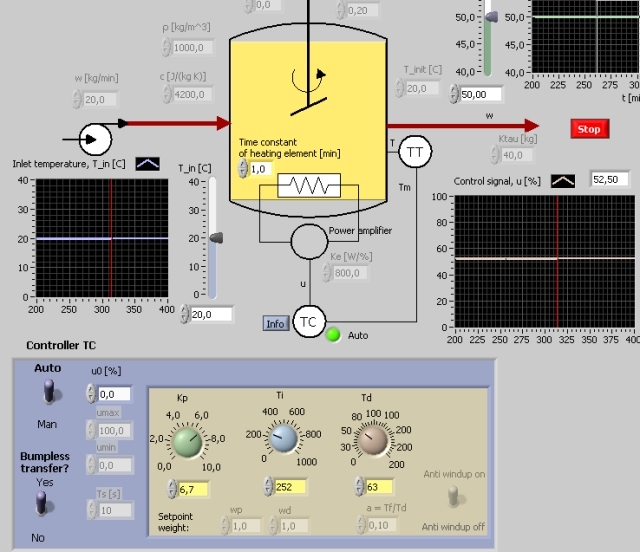 The aim of this simulator is to demonstrate why it is important that a PID controller has bumpless transfer. Bumpless transfer is an important property of practical PID controllers. You can assume that bumpless transfer is implemented in commercial PID controllers. If you are to implement a practical controller yourself, you should implement it with bumpless transfer. The tank temperature T is 50 degrees C. The temperature setpoint TSP is 50 deg C.
The inlet temperature Tin is 20 deg C.
Unless otherwise stated the tasks below assumes that the simulator runs. Set the controller in automatic mode. Deactivate bumpless transfer using the proper switch in the parameter field of the PID controller. To clearly demonstrate the drawback of not using bumpless transfer you should set the nominal control value u0 to 0. Let the temperature settle at the setpoint value (50 deg C) (the integral term in the controller ensures zero static control error even if u0 if 0). Switch the controller from automatic to manual mode, which implies that the control signal to the process is u0 = 0. Characterize the control action during the mode switching. Switch the controller from manual to automatic mode, which implies that the control signal is equal to the sum of u0 and the P-, I- and D-terms. Characterize the control action during the mode switching. Set the controller in automatic mode. Activate bumpless transfer via the proper switch in the PID parameter field. You may set u0 to 0. Let the temperature settle at the setpoint value (50 deg C). Observe the value of u (it is assumed that the control error is zero, cf. Task 2a). Switch the controller from automatic to manual mode. Characterize the control action during the mode switching. Which value did u0 get immediately after the switching (compare with the value of u just before the switching)? Switch the controller from manual to automatic mode. Characterize the control action during the mode switching. Updated 16 April 2017. Developed by Finn Haugen. E-mail: finn@techteach.no.